Next up: The Cure‘s Piggy In The Mirror. A coiled up ball of Robert Smithful rage and anguish interspersed with a guitar solo of utter tonal gorgeousness. Next up: a song that features the immortal line You can tell a man who boozes by the company he chooses – it’s known variously as The Pig Got Up And Walked Away or The Famous Pig Song. Here’s a lovely version by Frank Crumit. And here’s a version that more of you will watch because it’s by Fozzie Bear. Scrabbling around a bit now I find a short snippet of Spider Pig sung by Homer Simpson and a “joke” version of Katy Perry‘s I Kissed A Girl renamed I Kissed A Pig (which I refuse to link to), and a rather funky SparkleHorse song simply called Pig. Thank the Lord for Pink Floyd, who can always be relied upon to write a song about something bizarre which is actually worth listening to. 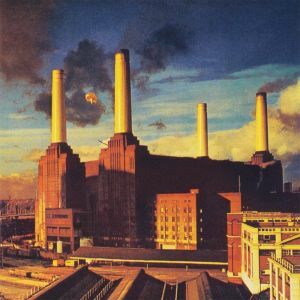 Here’s Pigs on the Wing, from the Animals album. A beautiful, lilting ballad which makes me wonder why I didn’t think of using Pink Floyd lyrics in one of the bloody books (there’s still time….). As ever, we welcome your suggestions, recommendations and links for pig-related cultural moments. 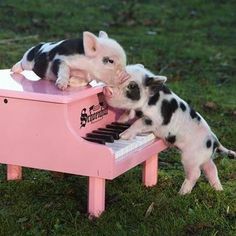 But please don’t send us anything like that atrocious picture of the two piglets with the piano that started this blog. Please…..
All of the above as a long winded way of saying: Sentient Zombie Space Pigs 2 launches this weekend at Melksham Comic Con. We’ll also have copies on sale at the Lakes Comic Art Festival and ThoughtBubble later this year. Come and find us there or order your copy online – just £1 plus P&P!